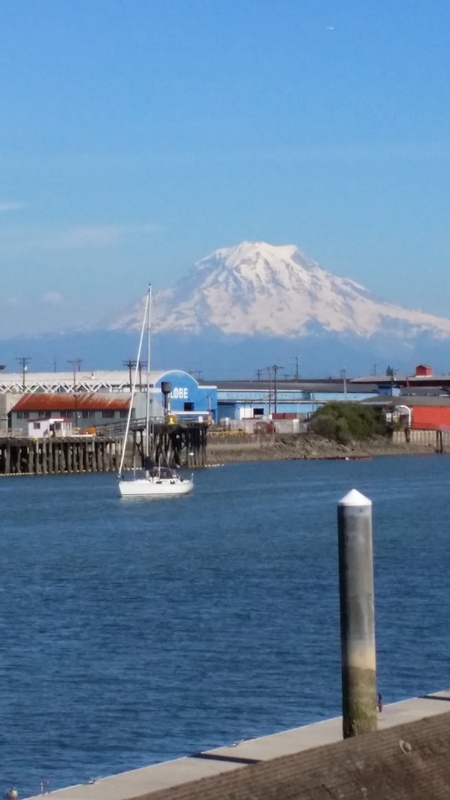 Last week I was working in Tacoma, Washington. The weather was dry and mostly sunny. 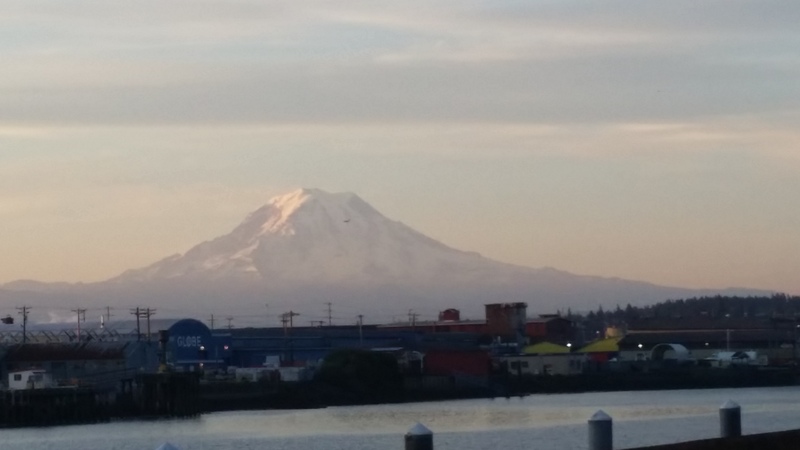 Consequently Mount Rainier was visible all week long. Even though the mountain is more than 70 miles away it dominates the view. At 14,411 feet, Mount Rainier is the tallest mountain in Washington and the fourth highest peak in the lower 48 states. 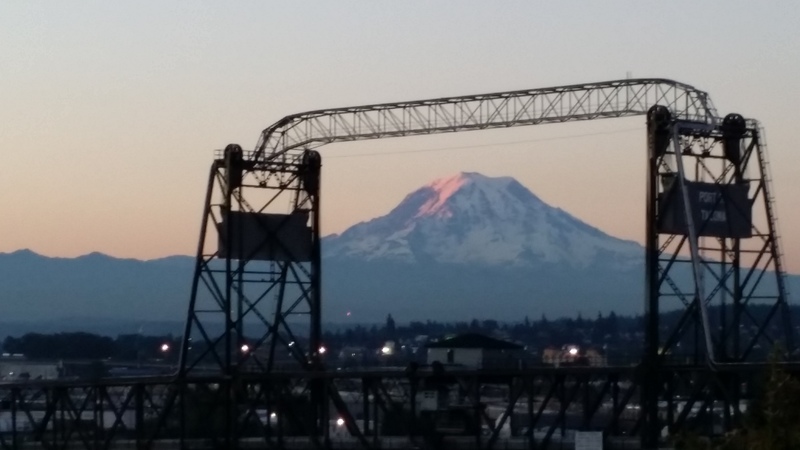 In the early morning the sun hitting the snow and glacier covered slopes produced a beautiful golden glow some 30 minutes or so before the actual sunrise in Tacoma. 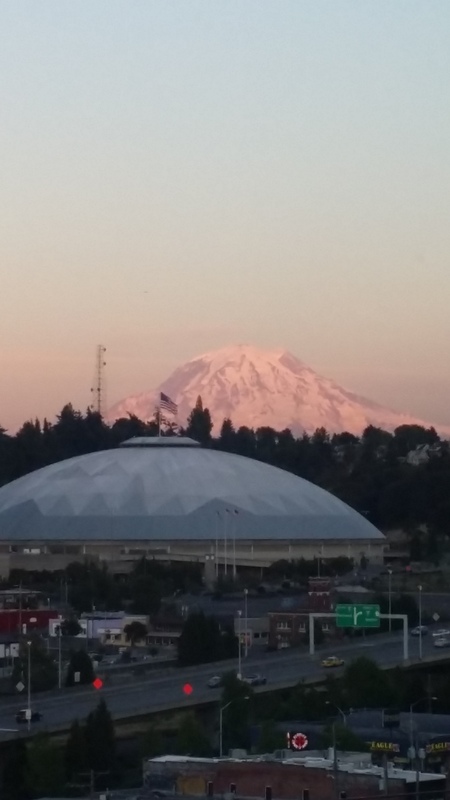 About 15 minutes before sunrise in Tacoma the sun has been glowing off Mount Rainier for at least 15 minutes. This shot makes me think of the “purple mountain’s majesty” from America the Beautiful. 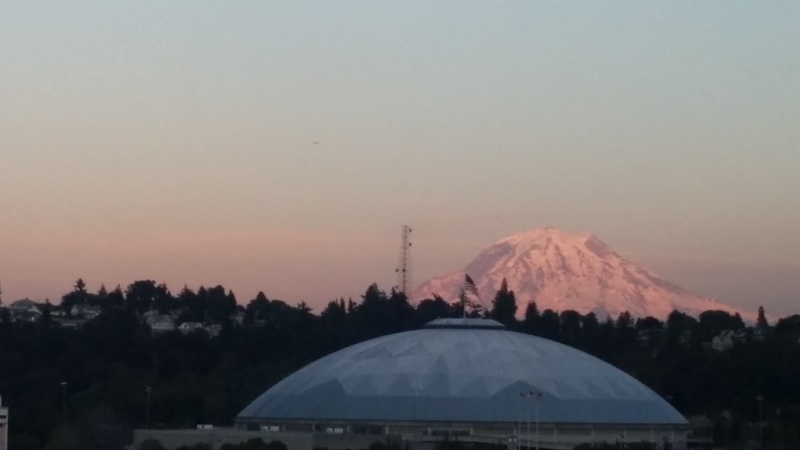 Even from almost sea level with buildings, trees, and man-made structure galore, Mount Rainier is still visible above the distractions. 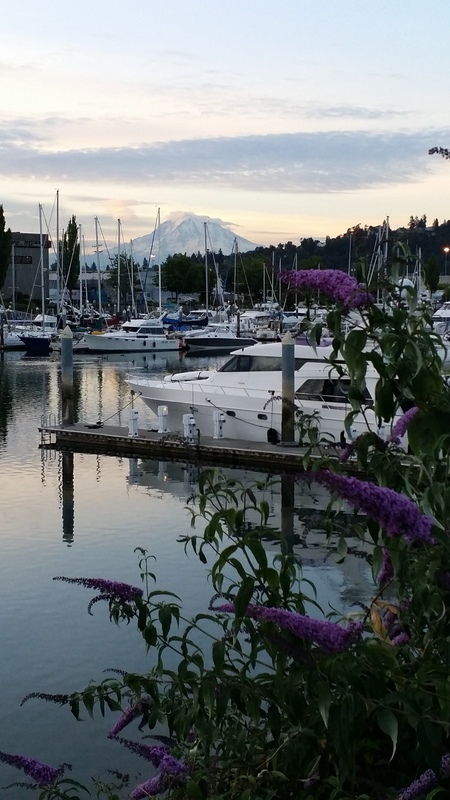 Another shot across the Tacoma marina. 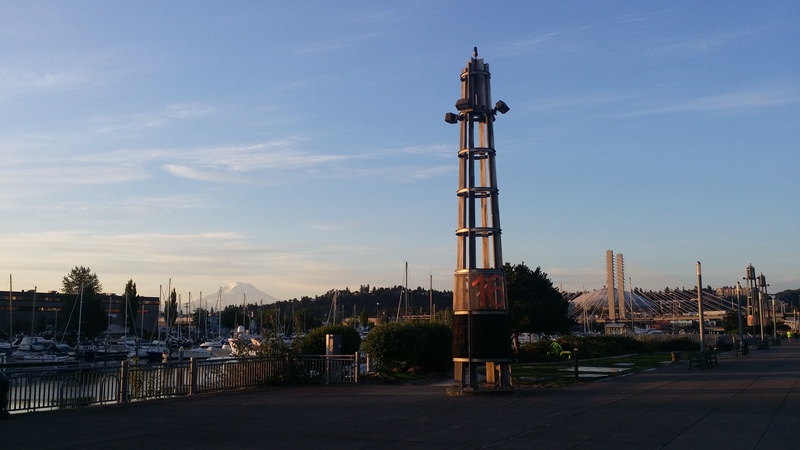 Across the harbor from a different perspective, a city park across from the Old Tacoma City Hall. 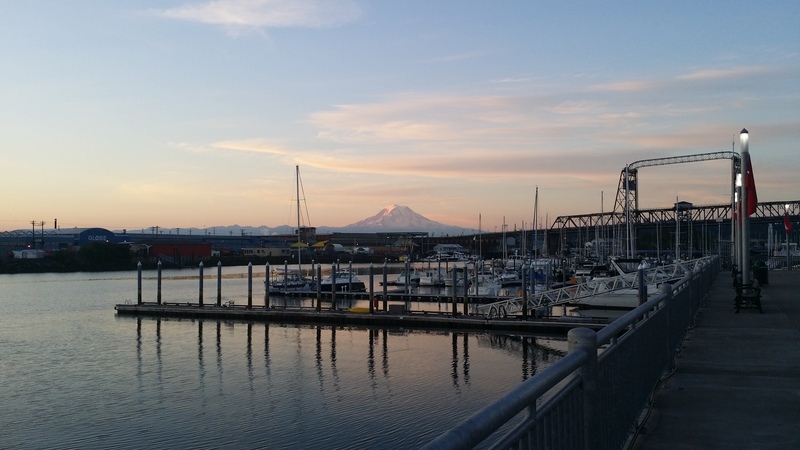 I liked how the mountain was framed by the draw bridge in this shot taken from the Park across from the Old City Hall. Throughout the day the mountain stood majestic in the background. At mid-day angle of the light hitting the mountain from the backside tended to mute the visible color if not the mountains stature. An early afternoon picture from the window in our training room. In the afternoon and evening with the light striking the mountain from the west, the ice and snow fairly glittered with bright white brilliance. Later in the afternoon with the sun in a more favorable position. I can’t help but get a selfie with the Majestic Mountain. 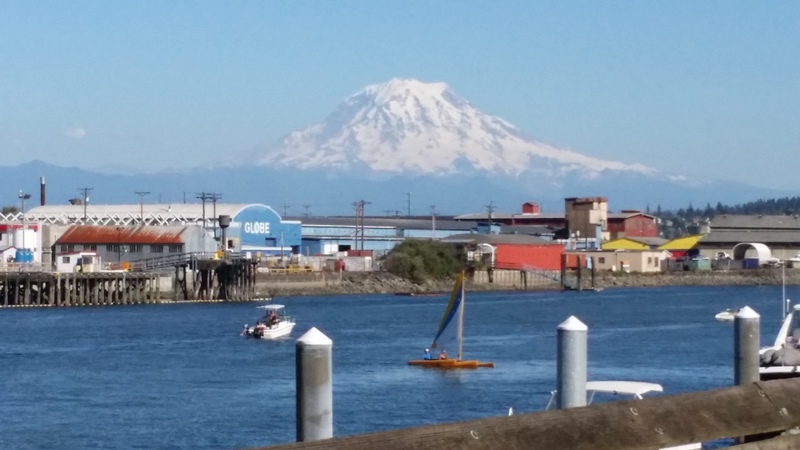 View from the Cliff House Restaurant across Commencement Bay from Tacoma. Even with a dreadful lack of snow this past season (I was told they got about 15% of normal) the top of the mountain is still blanketed in white. Finally as the sun set and the surrounding city and hills faded to grey, the last rays of light lit the mountain with soft pinks and shades or purple. Even the hill between the mountain and my hotel can’t hide the beautiful sunset on the mountain. View from my hotel room just after 9:00 pm. 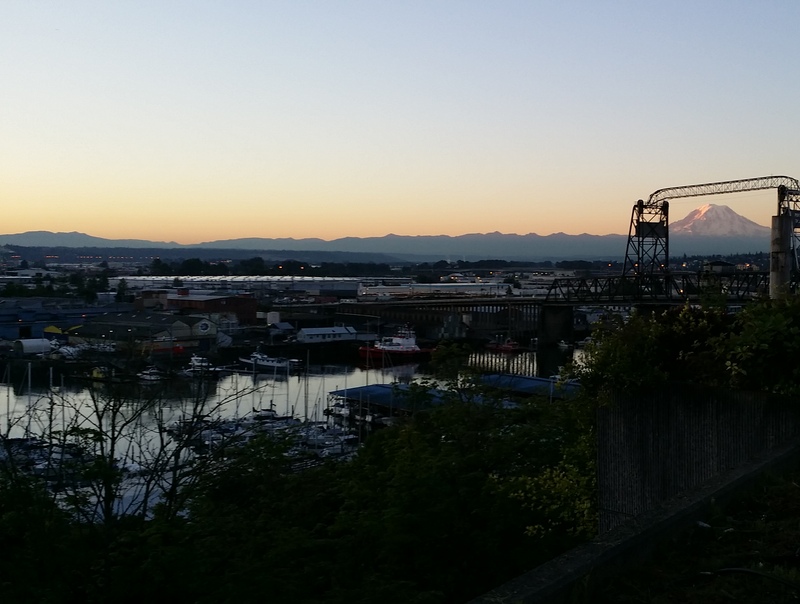 The sun has set in the city, but the mountain glowed for another 10 – 15 minutes, gently fading into the night. 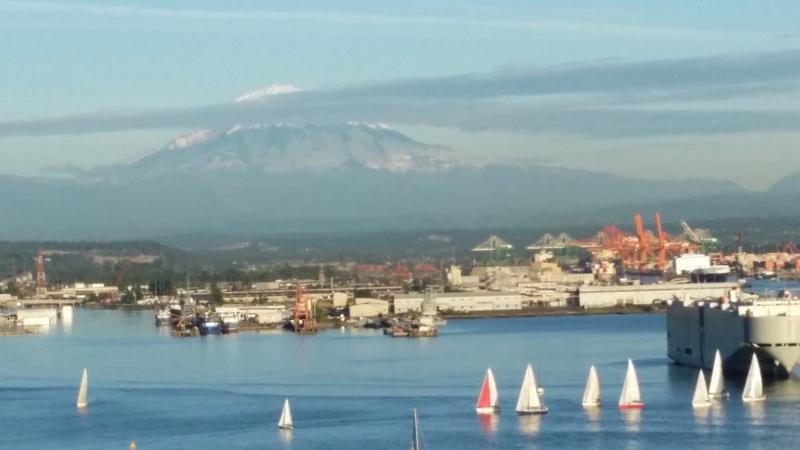 Whenever I was in a position to find the mountain, I would glance that way and be inspired. I have no desire to summit the peak, but I will travel to the mountain the first chance I get to visit and get a much closer view. I am drawn to it. 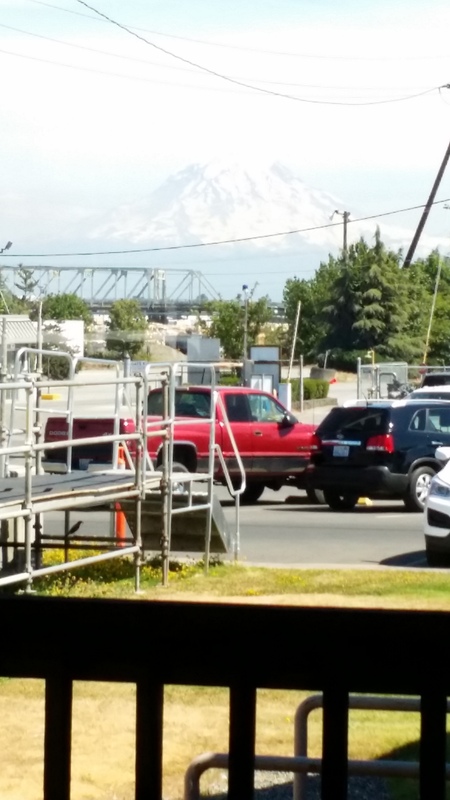 From one of the windows where we were meeting the mountain was framed in the distance. When we took a break I would slip up to the window to take a glance. It seems funny, but seeing the mountain in the distance gave me a sense of awe and wonder that just felt good. Taking time to sense God’s presence is like sneaking a peak at that mountain. In fact there are a number of parallels between that can be made between the awe inspiring views I observe and seeking God. Like that mountain God is majestic. He is the Lord God, Creator of heaven and earth. He is the Ruler over all the earth. All power, dominion and honor is due to Him. The mountain did not move while I was there, but the view of the mountain was constantly changing in subtle ways. In Hebrews 13:8 we read that Jesus Christ is the same yesterday and today and forever. God does not change. However our knowledge and relationship with God undergoes a metamorphosis as we seek Him and follow His leading. While I was blessed with sunny weather and clear views for five days, the locals told me that the mountain is usually shrouded in clouds. One person even said that the mountain makes it’s own weather with sunny and clear often transformed to clouds and fog around the mountain. Likewise, God is sometimes hidden from our view. It is by faith that we “see” the Lord. As I have shared in a number of stories in my blog, God is actively engaged in our lives and His intervention is often visible. But there are also times when things happen that can cause us to wonder where God is. The killing of nine people in a bible study in Charleston, SC a few days ago is one of those times. Yet even when the clouds roll in and obliterate the view or when bad things happen to good people, it does not change the fact that the mountain and God are still there and they are not diminished. Another similarity that struck me was how many of the locals seemed complacent to the awesome spectacle of the mountain on their door step. From a practical point of view, I can understand that we can’t sit and gawk at the mountain all the time. We have to get on with life, work, and the activities that enrich our lives. But I think this is precisely where we can err. When we become complacent about the majesty around us, particularly the Majestic One Who is our life-giver, our savior, and our sustainer, then we have truly diminished the life He has called us to live and enjoy. God knows we need to eat and drink and work together, but He also knows that abundant life begins in our relationship with Him. (Matt 6:25-33, John 10:10) To neglect spending time in His presence, to overlook the majesty of Who He is, to fail to recognize His hand at work in our lives, is to live a life far below what He has called us to. At it’s least bad, this is to fail to receive the blessing God wants to give us. At it’s worst, this is an affront to the living Lord. I don’t know about you, but for me, I will make it my aim to glory in the majesty of the Lord God, to dwell in His presence, and to make much of Who He is and what He has done for us. Be blessed today and bless the ones God brings into your life today. What is the first thing you do in the morning when you wake up? It’s probably not what most of you just thought of. The answer I am looking for is what you do as you are going to do the thing you likely thought of. You walk through an open door. Now one of the reasons this didn’t come to mind is because we do it all the time. I think it is safe to say we pass through dozens of doors every day. My father raised my brothers and I to be courteous of others and to be gentlemen. (Truth in reporting, any shortcoming in this area is not due to a lack of effort on Dad’s part, but stubbornness on mine or my brother’s side.) What did sink in is that doors represent an opportunity. If I am walking with a group, I will quicken my pace as we approach a door so I can hold it open for others. In particular, Dad taught me to hold a door open for ladies and children. What to do for other men was never really clear in my mind… As I ponder it a moment I have to chuckle as I think of the number of awkward moments as I would approach a door at the same time as another guy and we would both wave the other through. As we would stand there pedestrian traffic would back up waiting for us to decide. Many times we would decide to walk through at the same time and then it really got interesting as we now weren’t sure what to do. A door is simply the access point from one area to another that a person can pass through. In our home we have doors into the bedrooms. As I slip out earlier than my wife on most mornings I ensure that the door is closed to minimize the noise that would disturb her sleep and to let the grandsons know not to go inside just yet. One of the things we liked about our home before we bought it was the welcoming front door. It is attractive and inviting. However it also has a deadbolt and is sturdily built. For friends and visitors our door is opening and welcoming. But for intruders and persons of ill-intent the door is a barrier. I can think of many other doors I’ve seen and passed through in my life. For some of those there is a lot of emotion tied to them – job interviews, the doors of the church as I headed in to await my new bride at the altar, classroom doors at school for the first time, the office door of an unhappy boss, the door of a new shop, emergency room doors. There are other doors I have not passed through and, for some I hope I never have to – the doors of a courtroom where I am a party to the litigation, into a jail cell, a police station, the door at a home for an employee who has been injured or worse on my watch. Scott was my best friend in high school. We did all the things best friends do; we argued some, we played a lot, we had each other’s back all the time, and we grew from boys to young men together. My job out of college took me several states away and Scott and I didn’t get to connect as often, but when we did it was always great to catch up. It’s funny, I remember reading Scott’s last letter a number of times… the handwriting was the same, his sense of humor still showed through, and my heart was warmed by the friendship we still shared even though we were hundreds of miles apart. Shortly after Scott’s 40th birthday my wife called me at work. She had just gotten word that Scott had died in his sleep the night before. I can honestly say that was one of the hardest blows I have ever suffered. Scott knew about my faith and he had said he was happy for me, but we had not really taken the time to grow in our faith together. I still miss my friend, but it is not a sense of gone forever since I am confident that we shared a faith in God and in the completed work of Jesus. Two and a half weeks ago, I found out on Facebook that Scott’s mom, Liz, was very ill and in her final days. My heart went out to her husband and her family. Obviously I prayed for them and their comfort. I also prayed for the easing of Liz’s pain. But I also could not suppress a sense of joy as I prayed for Liz. I can still picture her as the beautiful, young mother who always had a smile even as she foiled another one of Scott’s and my schemes. I can hear the sweet southern lilt in her voice as she said, “Now boys you know that you’re not supposed to…” As I prayed for Liz in the days leading up to her passing the recurring picture I had was of Liz approaching a large door. I could feel the mixture of emotions as she was sad to be leaving her beloved husband, children, and grandchildren, but I could feel the excited anticipation of seeing Her Lord face to face and being reunited with her son, Scott. I attended Liz’s funeral a week ago. To me it was a perfect blend of sad farewell, celebration of a life well-lived, and the joy of graduation to something greater. The memory of it lingers with me. Additionally the picture of the Final Door remains. They say that death is one of the two certainties in life. It is inescapable. For each one of us we will face that Final Door. Do you know what is beyond that final door for you? Do you have an understanding based upon first hand knowledge of someone who has been there and come back? There is One who is an authority. The bible says Jesus conquered death and the grave. Over 500 people saw Him physically returned after He was crucified. Many of these followers died martyr’s deaths refusing to give up on the truth of having seen Jesus alive after His crucifixion, burial, and resurrection. His promise is life, eternal life, to all who would put their trust in Him. I encourage you in the privacy of your own home, in your secret place to look into what I am telling you. Pick up a bible and read what it says. Begin in the gospels. Ask God to show you truth. Comment back to me if you would like to start a conversation. God wants to enter into a relationship with you and He wants to give you a surety about what you will see on the other side of that Final Door. Today, right now is a good time to nail that down. If you already know Jesus and to you the Final Door is simply the passage to your final home, then rejoice with me in the grace God has given us tell someone today about the hope you have within you. Take care and have a most blessed day. As I rose this morning I wondered if the storm that crashed in upon us at dusk last night would result in a glorious sunrise this morning. I hurriedly got dressed as an excitement rose within me to commune with the Father and see what the morning light ushered in. 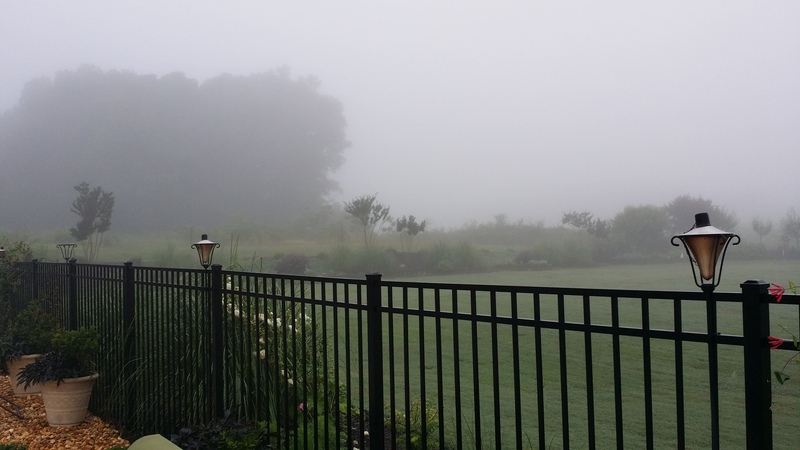 Surprisingly, my excitement only rose when I looked out the window and saw the fog. Grabbing my bible and hot tea I headed outside. This morning’s post requires a little background before I get to the good stuff. I am in a new phase of my life. 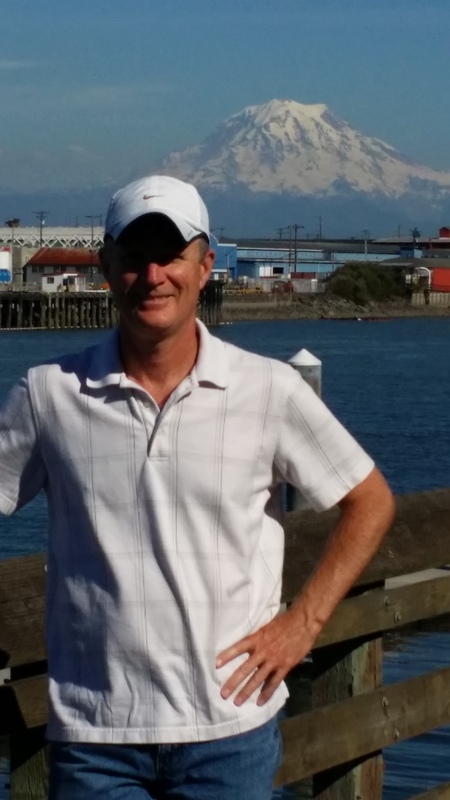 At the beginning of this year after almost 32 years of constant employment and increasingly responsible positions within three different companies, I found myself unemployed. The way the separation transpired left me with unanswered questions and a fair amount of emotional loose ends to work through. I had the basis of a plan already formulated, but I had not done much work in setting the plan in motion when the separation arrived. So even as I moved into a time of soul-searching I also moved into hurry-up mode to become an independent consultant in my field of expertise. Today, five months later I have made more progress on the soul-searching side, but both are progressing. Which brings me to the lesson in the fog. Our church is currently going through a series called “Without a Doubt”. We are looking at God’s faithfulness in life’s most trying times. As Pastor P said several weeks ago every person is in one of three stages in life. Either they are in a storm, they are coming out of a storm, or they are getting ready to enter a storm. 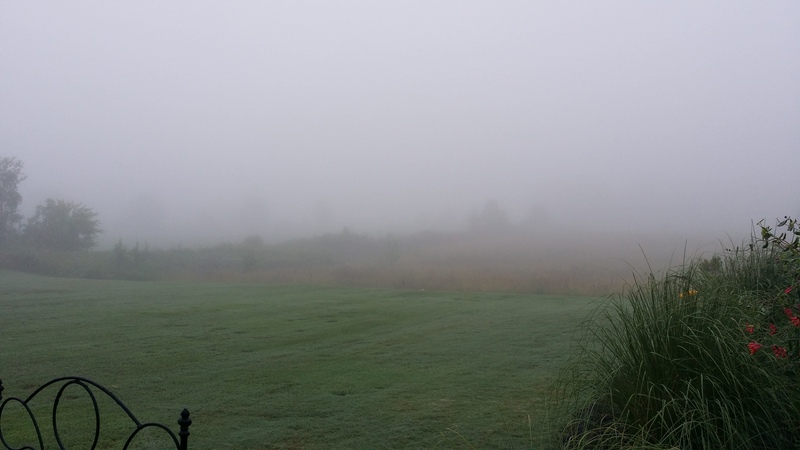 Last night’s storm dumped a lot of rain and that moisture created the fairly dense fog this morning. Storms do that. Their impact can linger even after the deluge has passed. The fog after the rain. As I prayed this morning I realized that since I came to faith I don’t believe I have doubted God’s love. I have experienced periods of uncertainty about what the results would be in a storm, uncertainty whether my response would be right and good, uncertainty whether I would stand in the God-honoring way I desire, but I haven’t been uncertain that God is or that He is sovereign. Digging deeper though, I have been uncertain that God’s love would manifest itself in a way that I could bear. It was not whether God loves or that He would be with me. Those are unshakeable truths. But I recognize in myself the weakness of thought and action that leaves me yearning for more of Christ and less of me. At that moment I raised my hands and looked up into the grey mist all around and above and I praised the living Lord. Immediately I thought of what was on the other side of that grey mist – a glorious sunshine that was bright, golden, and warm. A light that is life giving. A light that is always there. A light that I am certain is there. It dawned on me in that moment that God’s love is the same as the sun. It is always there… it is life-giving… it is bright, golden, and warm. My doubts and uncertainty are swallowed in the certainty of God’s love. It is a redeeming love. Even if I lose all, God’s love can and will redeem what is lost (See Job 42:10). Even if the way is dark, God’s love is the light of dawn speeding toward us. Even if my faith slips and my response misses the mark, God is faithful and just to forgive us and restore us because of His love. I had two key take-aways from the message this weekend that apply in every storm and in the fog. First, if the situation we are in is not good, then God’s not finished. Second, in the times when I cannot see God’s hand, when I can’t understand what is going on, I can always, ALWAYS trust His heart. Let the storm come. Let the fog roll in. Let the darkness settle upon us. In all things and in every situation God is there, God is light, God is life and God is love! As I finish this blog I look out the window and within the past five minutes the fog has lifted. I think I will take that as I sign I got it right. AWESOME! He is SO GOOD! Rejoice today my friend. God’s love is precious and it is near. Take hold of His hand today and let us rejoice! Two and a half years ago my wife and I felt prompted to make an addition to our home. It seemed a little odd since we were facing an empty nest within 8 months as our youngest of four was about to graduate and head off to college. As we continued to pray the nudge became a clarified vision and so we began the process. The addition was to add a pool and a garage with an apartment over head. We designed it, found a builder who worked wonderfully with us to get it done before the two weddings we had that year, and by Memorial Day we had a new swimming pool and pool house. One of the most exciting aspects of the process for me was the opportunity to design and add the landscaping. 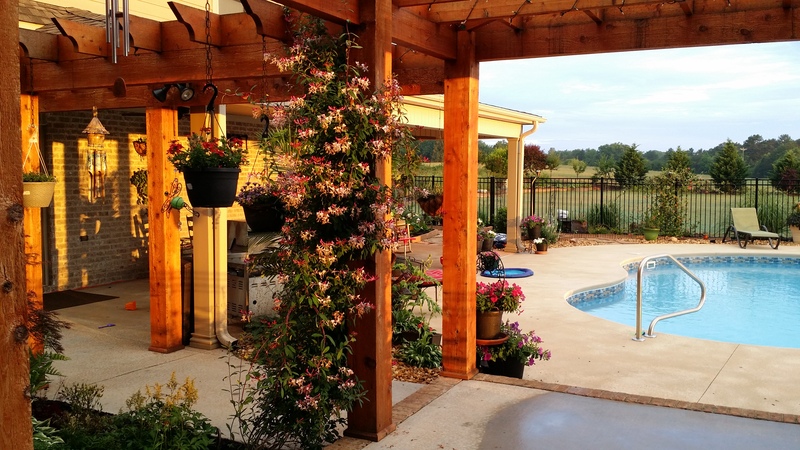 One of the coolest features we designed was a cedar pergola to connect the pool house with our home. This turned out really nice creating a rather strong contrast of the red cedar against the grey-brown brick of the buildings. Additionally it framed a small courtyard that needed the creative landscape touch. 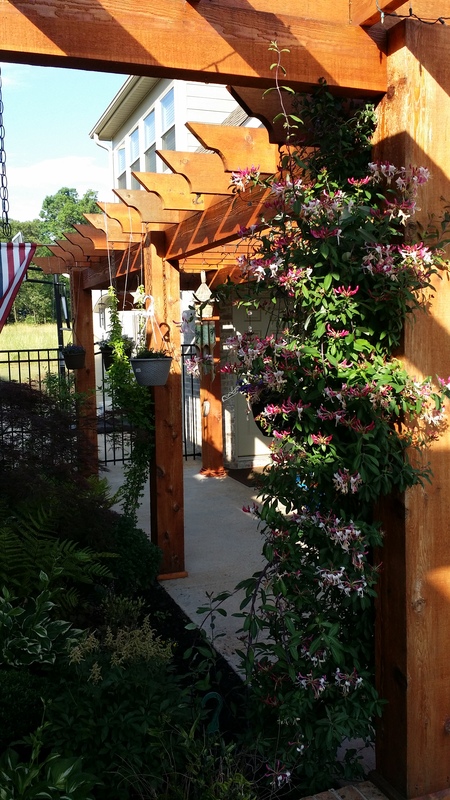 One of the things I envisioned were vines climbing up the pergola and providing an additional degree of natural shading as well as seasonal color. I found some plants that appeared like they would work and I added them into the plan. Today, two years after completion of the project I regularly begin my day talking to the Lord on the pool house porch. This morning I was struck by the wonderful fragrance that wafted in and around the little courtyard from one of the honeysuckles that we planted. The plant has climbed the 12 feet to the top of the pergola and is covered in delicate pink blossoms. As I breathed deeply I thought about how that little honeysuckle is like believers who grow into committed followers. Two years ago the plant arrived in a pot that I easily held in the palm of my hand. We were careful to plant it in good soil. We amended the soil and added the appropriate fertilizer. We also watered it whenever conditions warranted. A regular task through the growing season has been the training of the plant. You see honeysuckles spread broadly in their natural state. They tend to be invasive and a nuisance. We had in mind a vertical growth that looped up and over the pergola. So on at least a weekly basis we have had to maneuver the branches into the correct direction. Additionally we have pruned it removing dead and damaged growth as well as branches that weren’t heading in the right direction. There are parallels with the growth and training of this little plant and followers of Jesus. The start of our life in Christ is a very delicate time. If the enemy can’t stop us from hearing and responding to Jesus’ call to save us, he will double down to keep us from growing in our faith. He hates all Christians, but if he can prevent us from becoming effective, then at least he doesn’t have to worry about us working in tandem with God to expand the kingdom. During this period of vulnerability it is crucial that new believers be properly connected to a vibrant body of believers who will ensure they are fed, nurtured, and encouraged. A major challenge for new believers is the process of sanctification that we begin when we say YES to Jesus call upon our lives. Salvation is God’s gift given the moment we say yes to Him. Our new life in Christ begins then. It would be wonderful if all bad habits and sin tendencies were immediately removed at that time too, but it doesn’t work that way. My personal experience is that some of my sin tendencies disappeared immediately. Some did not. 1 Thessalonians 4 talks about living to please God which we do as we sanctify ourselves from the old habits and sins. In a very close comparison this is like the pruning that takes place on that little honeysuckle we planted. Unhealthy branches and branches that aren’t going the right way have to be removed. The same is true in our lives. And these things take action on the part of the new believer usually in alignment with the body of believers they are connected to. Time is also a similarity between our honeysuckle and the believer. I have seen a few new believers “flame out.” In every case they jumped forward with great enthusiasm and vigor, but they wilted within a relatively short time frame. They had not taken the time to grow, to develop the roots of faith needed to withstand persecution and the various attacks of the enemy. Jesus talks about this in the parable of the sower see Matthew 13:1 – 23, but especially verses 20 & 21. As I mentioned before the early stage of plant growth is a very vulnerable time. The roots must develop depth to be able to withstand a dry spell. I have a lot of perennials that I have planted. One of the worst things you can do for a perennial is water it too often. This results in shallow roots with no depth. If you then leave for a week or two and there is no rain you are liable to return to dead plants. This is one of the reasons that the Lord doesn’t just make life all fun and games. We must experience times of difficulty, challenge, and dryness to cause us to persevere, stretch ourselves, and grow our faith. Finally I mentioned the wonderful fragrance coming from the honeysuckle. In the old testament the burning of incense was a prescribed act of worship. Symbolically we view the drifting up of the incense smoke and fragrance as representative of our prayers and offerings rising to God. As we spend time in the Word of God, the Bible; as we sit under good, solid teaching; as we apply ourselves to serving others; as we seek to hear and obey God, we will grow in our faith. It may be all small steps, but they are steps none-the-less. We begin to take on the mind of Christ more and more. We are like that honeysuckle stretching, reaching, and growing. And in our season to blossom, we will burst forth in fragrant, beautiful bloom. Our devotion and love of the Father will manifest itself in the flower and fruit of a life established and growing in Him. Let me finish the story about why God gave us the vision to expand. 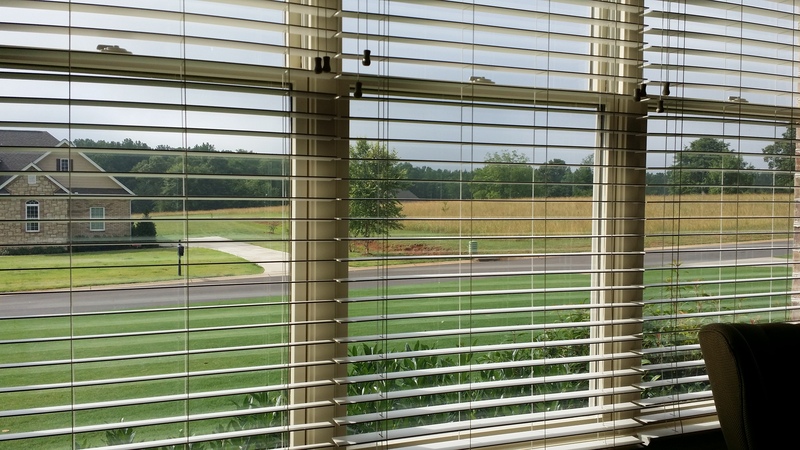 About the time we finished building, my sister’s house sold essentially out of the blue. They looked around for some place to live, but that wasn’t working out. Again that nudge from the Lord convinced us to offer up our home. The day after our youngest son moved into College, my sister and her family moved in with us. The extra room made it work fine. And then 8 months later, our oldest son who had moved away for what seemed like a good job opportunity, realized closer to family was important. So their family of 4 moved in with us. So when the vision was given we wondered why soon-to-be empty nesters would be adding on rather than downsizing. We didn’t know, but we clearly sensed the Lord’s leading so we obeyed. And because we did we have been blessed to grow so much closer to our grandsons, son, and daughter-in-law as well as my sister, brother-in-law, nieces, and nephew. I’m convinced that despite the challenges that three families living together will invariably bring, we have all grown through this experience. And I believe that part of that sweet fragrance is the love and service we have given to one another these past two years. Be blessed my friend and be a blessing to someone today. Climbing the pergola this honeysuckle looks and smells wonderful. I have a friend who agreed to walk through Proverbs with me over the month of June. We are going to each read a chapter a day and then share our thoughts about one verse from the chapter that impressed us. Here are thoughts from Proverbs, Chapter 1 on June 1. “The fear of the Lord” here to me is submission to the Lord, an open heart and mind to him. My bible states when we fear something, we either run from it or submit to it. I agree, my salvation was very similar to this as a lot of people’s may have been the same way. Once we have the fear of the Lord, it is a healthy fear as the fear we have of electricity or parents. It is a healthy fear or respect which causes you to act appropriately. But while seeking wisdom the fear or submission unto the Lord is the controlling principle of wisdom. This principle should not be abandoned and a person cannot just fully focus on the idea that we must just acquire wisdom alone. I believe that is where the fools despising wisdom comes in. They do not begin with that respect or appropriate fear. On proverbs 1:7 you made a wise choice. I always picture God’s awesome majesty, holiness, and righteousness when I consider “the fear of the Lord”. Romans 3:23 says that “all have sinned and fallen short of the glory of God”. That being the case, we all have reason to fear the judgment that we correctly deserve. The hope of favor with God can then begin to make us desire to walk right and submit. When we combine His majesty, holiness, and righteousness with His love, mercy, and grace – we have the awesome combination that causes us to joyously submit. My verse was verse 5, “let the wise listen and add to their learning, and let the discerning get guidance.” The last verse, verse 33, also echoes the theme. In verse 33 it is wisdom itself speaking saying, “but whoever listens to me will live in safety and be at ease, without fear of harm.” Verse 5 tells us what we are to do. Verse 33 tells us what the results will be. Wisdom is the correct and consistent application of knowledge. I have met many very intelligent people who weren’t really very wise. They struggled with making the correct application of the vast knowledge they possessed. I love knowledge, but I have learned that I would rather be wise than just smart. The common thread in these two verses is listening. It’s funny, but I spent a lot of my younger married years listening to experts about things, but I spent the majority of my time with my wife and family telling rather than listening. The Lord has shown me that my wife and even my children can be excellent dispensers of truth and wisdom. That doesn’t take away from trying to learn from experts, but it means that I should not overlook or despise the sources of wisdom the Lord will use close to me. One more thought that you may have also heard. God gave us two ears versus only one mouth. Wisdom is using this reminder that we are to listen twice as much as we are to talk. I haven’t studied it so thoroughly as to say if it is exactly 67% listening to 33% talking, but I know the general rule is true.